Durable thermally fused laminate work surfaces feature superior resistance to scratches and stains. All work Surfaces and leg end panels are 1" thick. Accepts Pencil Drawer or Keyboard Trays in center, right or left positions. Accepts Corner Module, Return Bridge or Credenza on right or left side. Accepts two 3/4 pedestals, 2-Drawer or 3-Drawer Mobile Pedestals. 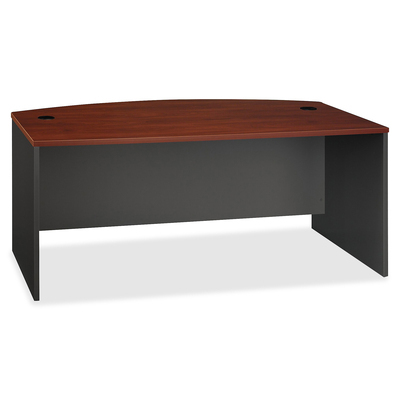 All desk work surfaces feature wire management grommets which can accept Monitor Arm w/Post. Series C Collection 72W Bow Front Desk Shell offers a classic styling with clean lines and extended modesty panels. Constructed with 100% thermally fused laminate for durability and superior resistance to scratches and stains. Create an expansive corner workstation with any Series C Credenza or Return Bridge on the right or left hand side of the desk. You'll enjoy the integrated wire management located within both desktop and leg grommets to conceal cables to keep your desk area uncluttered. Compensate for uneven floor surfaces with adjustable levelers.